The Budokan album was only supposed to be for Japan. They twisted my arm to do a live album for Japan. It was the same band I used on Street Legal, and we had just started findin’ our way into things on that tour when they recorded it. I never meant for it to be any type of representation of my stuff or my band or my live show. I believe this double LP was made available so our hero could boast of being outclassed by Cheap Trick, who had the self-control to release but a single disc from this location. Released 37 years ago today (April 23). The album was slaughtered by many critics.. especially in the US. Kurt Loder: That was when the critics started saying you were going Las Vegas, wasn’t it? Bob Dylan: Well, I think the only people who would have said somethin’ like that were people who’ve never been to Las Vegas. 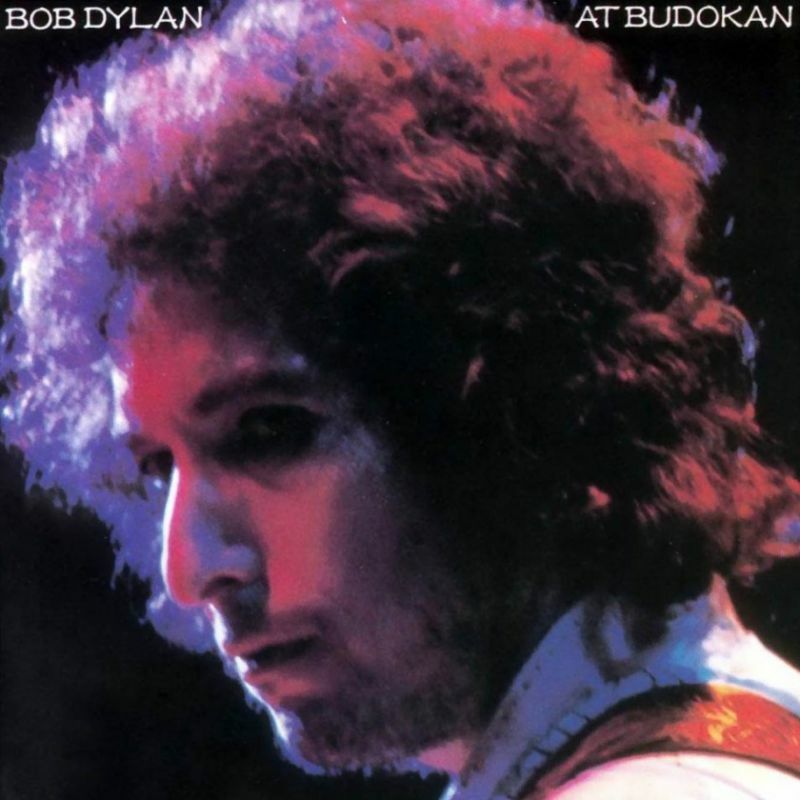 Bob Dylan at Budokan is a live album by Bob Dylan, released in 1979 (1978 in Japan) by Columbia Records. It was recorded during his 1978 world tour and is composed mostly of the artist’s “greatest hits”. The performances in the album are radically altered from the originals, using the same musicians that backed Street-Legal, but relying on a much larger band and stronger use of brass and backup singers. In some respects the arrangements are more conventional than the original arrangements and the album was criticized for being so. At the same time that it was criticized for being too polished, it was criticized for being too sloppy. For a few critics, such as Janet Maslin of Rolling Stone, the differences between the older and newer arrangements had become less important. The audio recording is from two different shows on February 28 and March 1, 1978. Columbia Records released this double LP on August 21, 1978; the original issue was limited to the Japanese market. Later that year, it was released in Australia. On April 23, 1979, spurred by extensive importing and at least one counterfeit European edition, Columbia released the album to worldwide markets. The shows were the fourth and fifth in an eight-show appearance at Nippon Budokan Hall in Tokyo, Japan. In a sarcastic review published in his “Consumer Guide” column, Robert Christgau gave the album a C+ rating, writing “I believe this double LP was made available so our hero could boast of being outclassed by Cheap Trick, who had the self-control to release but a single disc from this location.” Critic Jimmy Guterman named it one of the worst albums ever released in the history of rock. However, the album received stronger reviews in Europe, and critic Janet Maslin (then a music critic for Rolling Stone magazine) defended the album in her review. “The method here is hit-or-miss, and the results are correspondingly spotty,” Maslin wrote. 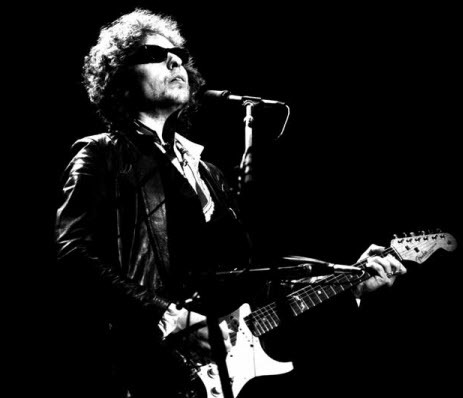 “The fire and brimstone are behind Dylan, [but] this hardly means the fight has gone out of him: Bob Dylan at Budokan is a very contentious effort—and, for the most part, a victorious one.” Ironically, fire and brimstone were to again become very much a part of Dylan’s music, with the release of his gospel rock album Slow Train Coming later in 1979. 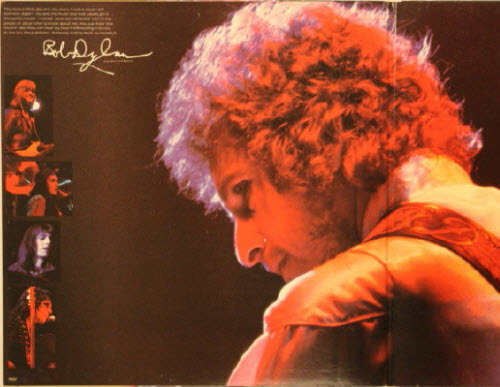 Bob Dylan at Budokan reached #13 in the US and went platinum, while simultaneously peaking at #4 in the UK. I heard that Dylan did some bad shows. I’ve never been to one. Lots of great ones, no bad ones though. Maybe I was sick that day. ….and it got me hooked for life! I walked into the Strawberries record store in Kenmore Square and saw this on display; the only time since I became a fan that I did not know about a Bob album before its release. Which was actually quite a treat! I enjoyed and still enjoy it very much. And let’s not forget that it came with lyrics! The critics don’t have a clue. Listen to One More Cup of Coffee, Watchtower, Ballad of a Thin Man, Just Like a Woman, Love Minus Zero and others. Great versions, wonderful instrumentation, rhythm, background vocals, horns, it goes on and on. Once again Bob confounded them all with another reinvention. That’s what sets him apart from all others. 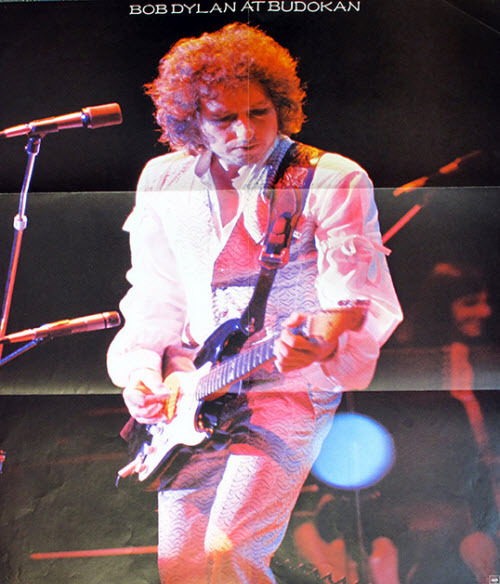 1978 was my 1st time of Dylan live, with many more to follow, I remember seeing this album in a backstreet record store in London and asking how much it was “It’s a Japanese import” they said and wanted some ridiculous amount. Of course I snapped it up when it became an official release and still brings back goose-bumps when I think back to that glorious summer evening at Blackbushe. 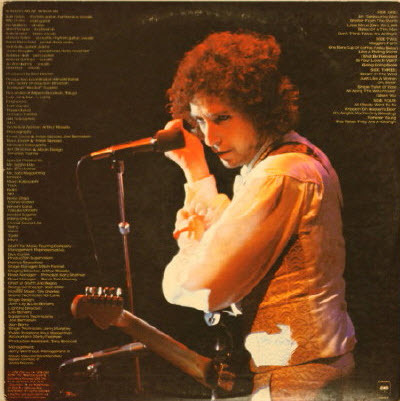 It’s a record of where Bob was at in the late 70’s no more no less but I love the big band sound, even now. I used to have that poster hanging in my bedroom! I recently listened to Budokan and unfortunately found it hasn’t held up well for me, which is odd in a way as I love the Street-Legal album. Still, it’s startling the difference between some of these songs and the same ones played on the Rolling Thunder a few years earlier. I think One More Cup of Coffee works the best. I caught this show in Tucson, AZ, and it was transcendent. When they blasted off into Like a Rolling Stone, I swear the stage came unhinged from its moorings and rose about ten feet into the air.